If you’ve ever had a marshmallow brownie I bet you’re hitting the Print Recipe button right now because they are GOOD! 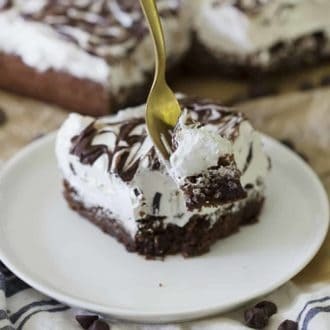 A rich chocolate brownie is topped with MOUNDS of marshmallowy fluff (you have to make your own, it’s easy and so tasty) then drizzled with more chocolate. I did a swirl but some people literally flood the top with ganache, there is no wrong way to go here. Anyhow You’re probably going to ant to double the batch as people will ask you to bring these to work/school/their house. The topping is really just Italian meringue with one key addition. Light corn syrup makes this ultra-marshmallowy. I wish I knew the science behind this but I came across this after some experimentation. Can you put marshmallows in brownie mix? YES! The soft gooey texture and sweetness of the marshmallow pairs wonderfully with the rich brownie. Add half a bag of mini marshmallows to the prepared batter or cover the brownie with them just before it’s finished backing. what can you do With Marshmallows? Whip up a batch of marshmallow fluff! If you’re in a hurry an easy hack for a similar taste is to pile some marshmallows on top of the brownie toward the end of baking and they’ll melt in the oven. You can also broil for a few minutes. What Desserts Can you Make with Marshmallows? Pro tip, don’t add gelatine to your molten sugar! Feel free to experiment with flavoring the marshmallow topping and swirling extra ingredients in. This could have some peppermint for a holiday twist or a peanut butter syrup for some good old American zazz! 😆 Hope you enjoy! 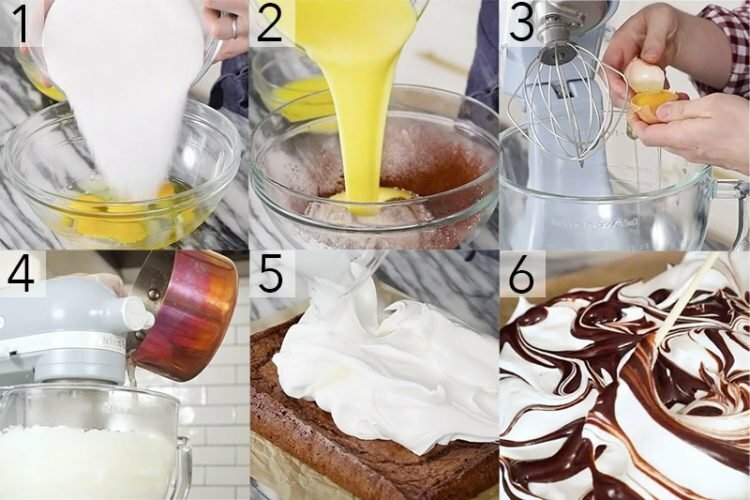 How do you make Marshmallow Fluff Brownies? For the brownie; Preheat the oven to 350 degrees and prep a 9×13-inch baking pan with parchment paper. In a bowl, combine the eggs and sugar then mix them together. Sift the cocoa powder, flour, baking powder and salt to a bowl and give it a whisk. Combine the dry ingredients with the egg and sugar mixture. Toss in the chocolate chips and the melted butter. Add the batter to the prepped pan, smooth it out and bake for about 30 minutes. For the marshmallow; Beat the egg whites and 2/3 cup of sugar until it forms soft peaks. In a medium saucepan, add the remaining sugar, 2/3 cup of water and corn syrup, then place on low heat. Maintain at medium high heat and stir until the sugar melts and becomes clear. Heat until temperature reads 235-240F. Drizzle the sugar into the mixer (running on low) immediately once it is ready. Now run the mixer until the marshmallow is cool. For the Assembly; Once the brownie has cooled, pile the marshmallow fluff on and smooth it out using a spatula. Melt 1/3 cup of semi sweet chocolate and about 2 tablespoons of cream together. pipe the chocolate ganache all over the top and use a toothpick or a skewer to create a more marbleized pattern of swirls. Enjoy! If you’ve tried this marshmallow brownie then don’t forget to rate the recipe and let me know how you got on in the comments below, I love hearing from you! The most decadent brownie I have had. It's topped with a thick marshmallowy layer and then drizzled with more chocolate. 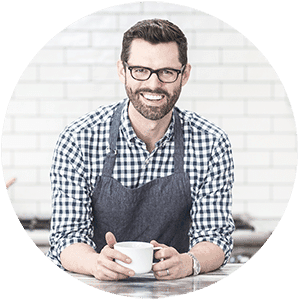 Preheat the oven to 350 degrees F and prep a 9x13-inch baking pan with parchment paper. In a bowl, combine eggs and sugar. Mix together. Sift cocoa powder, flour, baking powder and salt into a separate bowl. Mix again. Combine with egg and sugar mixture. Toss in chocolate chips and melted butter. Add batter to pan and smooth. Beat the egg whites and 2/3 cup of sugar until soft peaks form. Add cream of tartar if using. In a medium saucepan add the remaining sugar, 2/3 cup water and corn syrup, then place on low heat. Stir until the sugar melts and becomes clear. Add vanilla and run mixer until marshmallow is cool/tepid. Melt 1/3 cup semi sweet chocolate and about 2 tablespoons of cream together. Set aside. Once the brownie has cooled, pile the marshmallow fluff on and smooth it out using a spatula. Pipe the chocolate ganache all over the top and use a toothpick or skewer to create a more marbleized pattern of swirls. In the YouTube video, I used four eggs to make this brownie and it came out great, but I usually use two! I️ will definitely have to try these! I’ve never heard of marshmallow brownies so I’m very intrigued… I’ll report back after we make them. I always make my own marshmallows. They taste better than the packaged ones! I made these tonight. I guess a couple clarifications you might want to add ? I assume that you don’t too the brownies with the marshmallow until it’s cooled and I’m wondering how long it talked for the marshmallow to set up? It made way more than I needed for the brownies so I put some in a separate pan to just make some marshmallows . It tastes delishous ! Can wait to test the combination ! I wound have rated higher but the directions are lacking. Hi Cindy, Thanks for that feedback! I’ll clarify the directions. I like this brownie with a mountain of marshmallow fluff on top but it is still very tasty with a thinner layer. I don’t know what size the pan is that you used, but I do know the difference between a rectangle and a square. Your pan is definitely a rectangle and the recipe calls for a 9 x 9 square pan. Could you clarify? It looks really yummy. Thank you for the recipes. If you want your brownies to be a bit taller and thicker, use a square pan! I used a 13×9 inch pan for the video! It’s up to you! Just curious would the recipe change if I wanted to add walnuts? Toasted walnuts will be great in the brownies! Fold them in at the very end when you mix up the batter! Hope you enjoy! 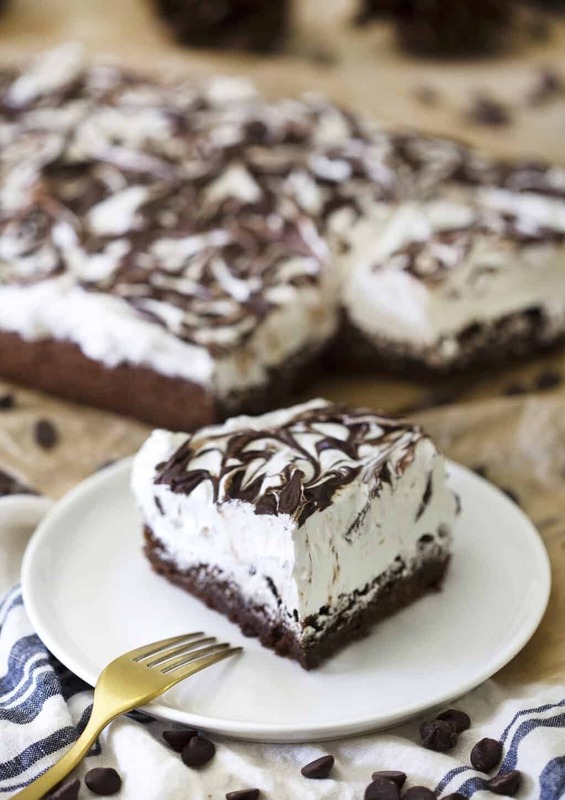 I’m going to make these marshmallow brownies and then marry them. Dream come true! I’m glad you like the brownies! Just wanted to tell you that everything I have baked so far has worked and is absolutely amazing!!! Your xmas cakes and cookies where are hit OMG my familt and friends couldnt get enough of them!!! These look amazing…definitely want to try…..but in the video you use 4 eggs!, but the directions say 2 eggs…..please clarify! Thanks! If you don’t cut it and find a way to wrap it up really well, you can keep it at room temperature for 3-4 days. Thank you John! As I suspected would happen most went the night of my dinnner party and the remainder went to work with my husband the next day so storage was a non issue!! But good to know! I need to make this for my boyfriend. Marshmallows and brownies are two of his favorite things. I made this using 4 eggs and made the amount of marshmallow recipe called for. I bake A LOT and even had a small bakery for a while…..this is by far one of the easiest and most impressive desserts I have ever made! Thank you!!! That’s so nice to hear! 🙂 I’m happy you enjoyed the brownie! I made these last night and they were delightful! As you suggested in the video, I reduced the marshmallow recipe by 1/3 and they were still super fluffy, gorgeous and dramatic. I could have eaten the whole pan, so to save me from myself, I put some on plates and surprised my neighbors with a special delivery from the brownie fairy. They were a huge hit! I’m happy to hear the brownies were a hit! What will you make next? I just got some 6 inch pans and will try one of your gorgeous cakes this weekend!